Part 9: Isaac. We all know about Isaac’s childhood. 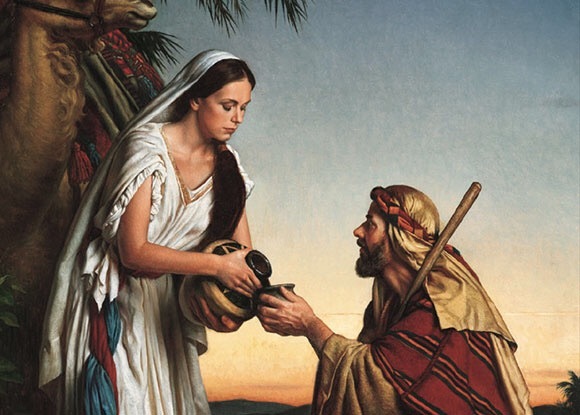 We know that he was raised in an unhealthy household, with the bitter division between Sarah and Hagar growing more and more heated following Isaac’s birth. We know that his father and mother both, though they were people of profound faith, were flawed individuals all the same. What’s more, they were also a flawed couple. As it turns out, the apple didn’t fall too far from the proverbial tree and this makes a lot of sense. For one, Isaac had to have been scarred from his childhood. Despite the family dynamics that were in place within his family, there is something else we’d be amiss not to mention. Isaac was approximately 2-6 years old, even older in some traditions, when his father Abraham took him up on Mount Moriah to sacrifice him to God. The whole way there, Isaac questions his dad, “When will we find a lamb for the slaughter, daddy?” He didn’t have a clue that his father was bringing him up the mountain with the intention of using him AS THE LAMB. His father’s response to him was, “No worries, Isaac, God will provide the lamb for the sacrifice.” Now, for this to truly be “faith”, Abraham had to believe that he WOULD BE sacrificing his son to God. Why you ask? Because if he knew that God would spare Isaac, that would NOT have taken faith; rather, he DID NOT KNOW, but fully anticipated the complete opposite of that. His faith was placed in the fact that God would keep the promise made to him that he would become the father of many nations despite the fact that Isaac was no longer going to be alive. But back to Isaac. He had to have been scarred from the whole ordeal. There is no way that he came back down from that mountain ever fully trusting his dad again. There is no way he could ever feel safe in his home. There is no way he wasn’t plagued by memories and nightmares, replaying the horrific scene over and over again in his mind. So, Isaac was bound to be just as flawed as his father and mother, if not more so. What we do know from the Scriptures is that he at least follows in the footsteps of his father and the sin of Abraham certainly passes down to his son. This can be clearly seen in the story of Isaac deceiving King Abimelech. Just like his father, Isaac was a coward who thought of his own safety over and above anyone elses. As he traveled through the land of the Philistines, he made his wife Rebekah act as his sister so that the king wouldn’t kill him in sexual conquest. So, like Sarah before her, Rebekah was going to be forced to be a sexual consort of the king, that is until God intervened and brought a curse upon Abimelech and the Philistines. We also see that Isaac gets into dispute over well water with Abimelech. This is not necessarily his fault, per se, but it shows the net result of sin: rather than being loving neighbors, people were becoming more and more tribal and territorial. Sin had taken brotherly love and replaced it with a “survival of the fittest” mentality. Humanity had fallen far from the paradise it was created to be. What we do see, despite Isaac’s failure to be fully faithful to his end of the covenant with God, is that God still remains faithful to Isaac and his family. The same is true for us. We are called into covenant with God through Jesus Christ, yet we are not always faithful to that covenant. We may be going on to “perfection” through the Holy Spirit, but we are FAR from perfect and our sin has real consequences; yet, God, who is faithful, will not abandon us to our sin, but is ever leading us to rise up out of the ashes of our sin and into the promise of eternal, abundant life. Left on our own, there is no escape from our propensity to sin. Lord, have mercy on me, a sinner. Cleanse me from my sins and perfect me in your love. Amen.